Near Downtown Los Angeles, there’s a park called MacArthur Park with an eight-acre lake. Built in the 1880s, the park became a vacation destination surrounded by luxury hotels. In the early part of the 20th century, the MacArthur Park area became known as the Champs-Élysées of Los Angeles. While not as large as one of Michigan’s Great Lakes, MacArthur Park’s lake recently became famous due to a unique floating art exhibit. An estimated 2,500 vinyl colorful spheres, between four and six feet in diameter, were hand-painted in floral or aquatic designs by roughly 10,000 volunteers around the Los Angeles area and placed in the lake at MacArthur Park. This unique art exhibition was orchestrated by the Los Angeles-based arts nonprofit Portraits of Hope, known for conceiving and developing one-of-a-kind motivational art projects. Portraits of Hope projects have transformed airplanes, buildings, and the New York City taxi fleet to blimps, tugboats, and NASCAR racecars. More than 800 hospitals, schools, after-school programs, and social service agencies have participated in Portraits of Hope projects and programmatic activities, in addition to an array of adult community groups. The founders of Portraits of Hope are brothers, Ed and Bernie Massey, who were raised near MacArthur Park. One explained that the park was once a true destination, with its lake and paddleboats. The two brothers wanted to revitalize the park and recreate its “wow!” factor. The “Spheres of MacArthur Park” will be on display for four weeks, and then the spheres will be donated to local schools and hospitals. 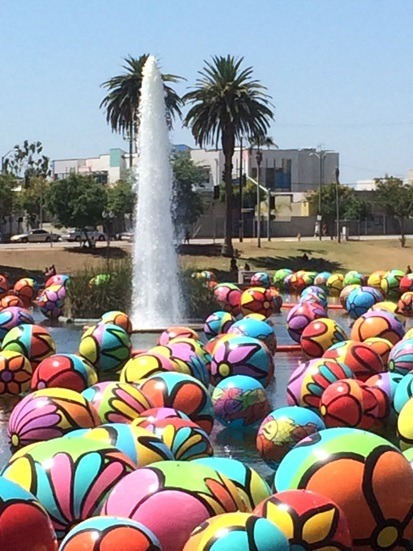 The larger-than-life, multicolored spheres were produced by volunteers from around Los Angeles, many of them schoolchildren and youth from the Braille Institute, Miller Children’s Hospital in Long Beach, and the Shriners Hospital for Children, among others. In addition, a variety of businesses supplied all the materials and transportation free of charge. Portraits of Hope co-founder Bernie Massey explained that the cost of the project would have been around $1.5 million had the community not mobilized.